this post is sponsored by Tria however all thoughts and opinions are my own. 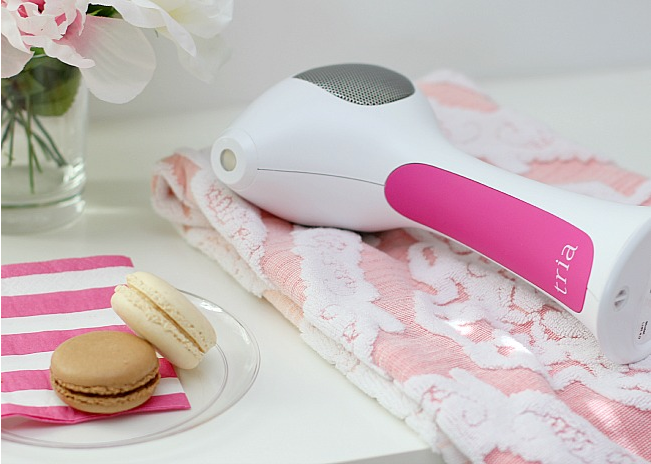 this spring/summer i was given the opportunity to review the Tria Hair Removal Laser. you can find my first post here with information on the product and my thoughts on giving it a try. after having used it four times my feelings on it continue to improve. the Tria Hair Removal Laser is the first and only FDA-cleared hair removal laser available for home use. the Tria Laser 4X uses the same diode laser technology preferred by dermatologists. the Tria Laser 4X targets and permanently disables the hair follicle to stop hair growth on the face and body for permanent results. i have been using the Tria Laser 4X at home. it gives you the option of using a power level ranging from 1 being the lowest and 5 being the highest. i have used the Laser at power level 3 each time i do a treatment and have already seen some major results. the areas i use it on are underarm, bikini and legs. after the first treatment i immediately saw results in hair that grew in sparser. after having used it four times the hair growth has nearly stopped. there are some small spots that are a little patchy with hair growth but i think if i continue to use the laser and increase my power level those areas will be removed easily. when i first started using the Tria Laser i didn't realize how much i would like it. one of my biggest pet peeves during summer is razor burn. whether i am shaving or waxing i always end up with angry red bumps for a day or two. using the Tria has virtually eliminated any razor burn issues. i still shave the areas to remove any remaining hair however the angry red bumps haven't made an appearance. in the summer when your body is so exposed and i am practically living in a swimsuit it is nice to have that issue eliminated. plus, right now Tria is offering a summer special. if you order now you can get a beach tote and gift card along with your purchase using the offer code: SUMMER. if i am ever considering investing in a beauty item i always like to get the most bang for my buck. i'll continue to keep you posted on my experience with the Tria throughout the next couple weeks but as it stands currently i am a very happy camper.